One of Robert F. Kennedy’s daughters is claiming that former President George H.W. Bush plans to vote for Hillary Clinton. Kathleen Kennedy Townsend, whose name apparently appears as Kathleen Hartington on Facebook, posted a photo on the social networking website of her shaking the former president’s hand, with the status, “The President told me he’s voting for Hillary! !” according to a screenshot captured by CNN. Bush’s spokesman is neither confirming nor denying the report. “The vote President Bush will cast as a private citizen in some 50 days will be just that: a private vote cast in some 50 days. He is not commenting on the presidential race in the interim,” Jim McGrath said in a statement. In May, McGrath and a spokesman for President George W. Bush said the two former presidents were not planning to endorse Donald Trump for president. “President Bush does not plan to participate in or comment on the presidential campaign,” the younger Bush’s spokesman Freddy Ford said at the time. “At age 91, President Bush is retired from politics. He naturally did a few things to help Jeb, but those were the ‘exceptions that proved the rule,” his spokesman McGrath said. 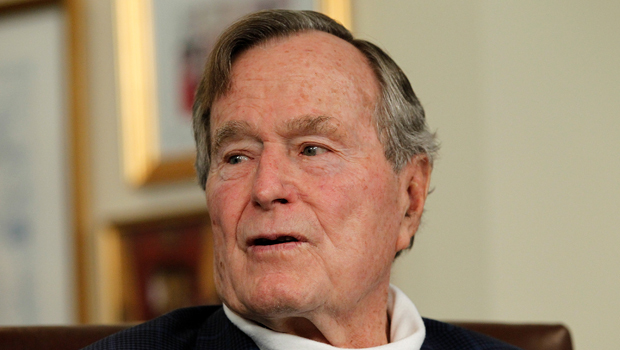 The elder Bush is now 92 years old. Kennedy Townsend, a niece of former President John F. Kennedy, previously served as lieutenant governor of Maryland. Bush, who has a house in Kennebunkport, Maine, is registered to vote in Houston, Texas, McGrath told CBS News.